After our Geghard and Garni jaunt, and just a couple of hours up the road, we were hoping to find a good place for lunch and then make a decision whether or not to continue on to Tbilisi or spend the night. 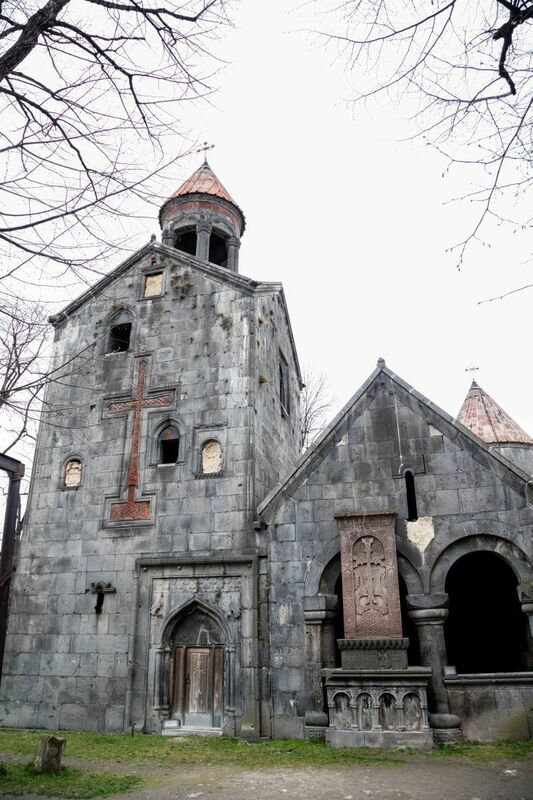 We drove into the small city of Sevan and it was pretty deserted. Right in the center we encountered some businessmen and a school full of students, but it didn’t seem like much was going on, and once again we couldn’t find a restaurant or cafe. 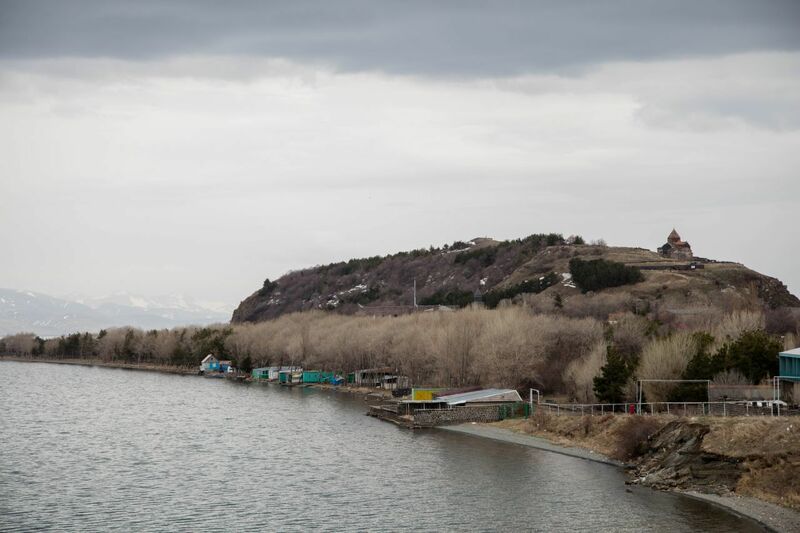 As we arrived in Lake Sevan, everything was shuttered and debris was collecting against all the walls. I’m sure we missed them cleaning it up and getting ready for the tourists to start pouring in by just a couple of weeks, but we were clearly too early. Needless to say, we didn’t hang around long and were once again headed north, changing our idea of what we were going to do and heading to the world heritage sites of Sanahin and maybe Haghpat. 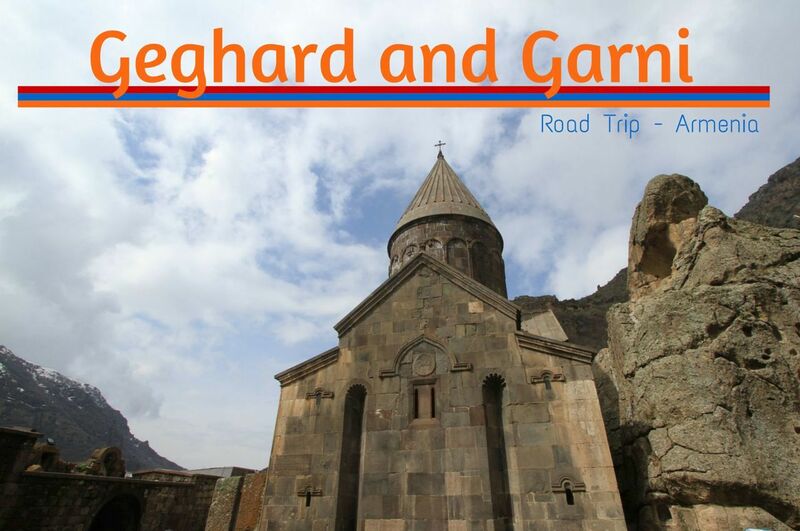 Who wants to do a road trip in Armenia? Luckily we saw a very crowded road stop, so we screeched in ready to use the facilities and find something to fill our bellies. We could see why the place was so crowded as it was the only place that offered food for miles and miles and miles, well you get the picture. Entering we were blown away with choices. There was a bakery complete with two hot barrel ovens built into the floor. In one, a lady was making lavash, which is their famous flat-bread. She would take the pulled dough, slap it on her material covered board, and then reach deep down into the oven to stick it on to the hot wall. The other baker was doing the same with a long, more baguette style of bread. He would put three or four on his board and slap them all on together, but that bread takes much longer to cook, so he would have to practically dive in to maximize the heated wall space. I hope he gets paid a lot of money; I could feel the heat of the oven a few feet away as I took his photo. Ouch. We had to eat some famous lavash, and the perfect way to do it was to get a shwarma (aka doner kebap). We happily climbed back into the car to head up, up, and up as the road leaving the lakeside climbs immediately into the mountains. As we drove, we really wanted to hit a few more sites, but we were burning daylight. Traveling in early spring doesn’t give you many hours of daylight and we were convinced by now that we would probably head back to Tbilisi. We did make it to the next site, the Sanahin Monastery. Climbing out of the car, we noticed the gauntlet of vendors, with a bunch of ladies selling some souvenirs, but nothing really called to us and nothing was edible, so we easily passed them by with a couple of words and big smiles. As we entered the grounds, we noticed a ticket booth, so we went up to buy a ticket but the lady said we didn’t have to pay. I don’t know if that means it really is free or if she thought we had arrived too late to do much. 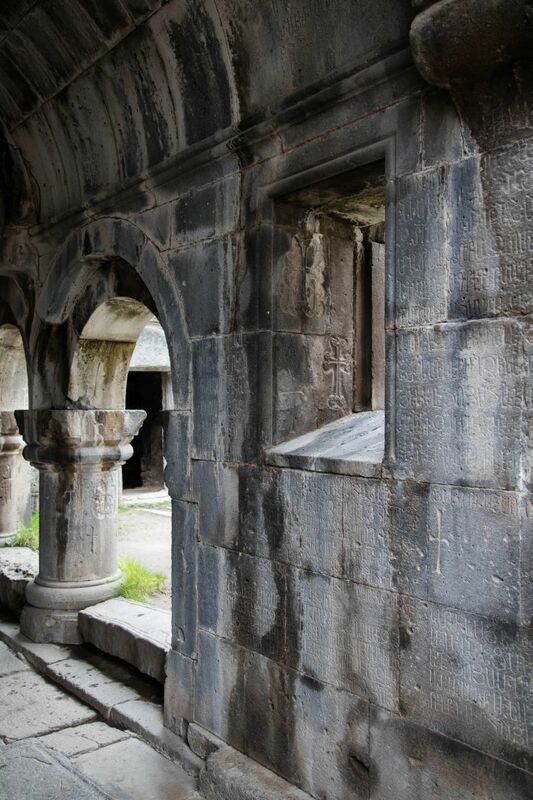 The Sanahin Monastery along with its neighbor, Haghpat were included on the UNESCO World Heritage List in 1999. We only had time to see in the inside of one and we arrived here first, so in we went. 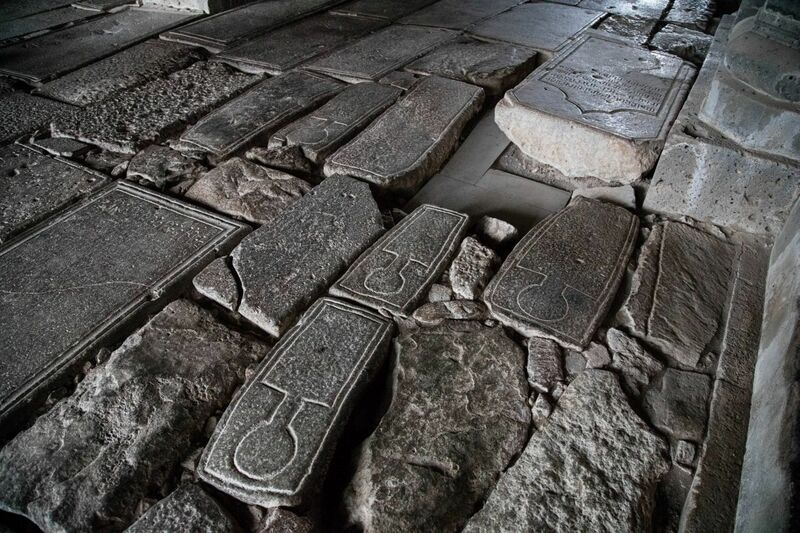 Except for a small van of German tourists, we were alone and really enjoyed looking at the bishop gravestones as well as the carvings on the khachkars. The entire complex felt serene and peaceful, such a dramatic difference to the feeling you get while you are driving on the road. We wandered for some time, climbing over the high entry steps to enter various rooms and passageways. 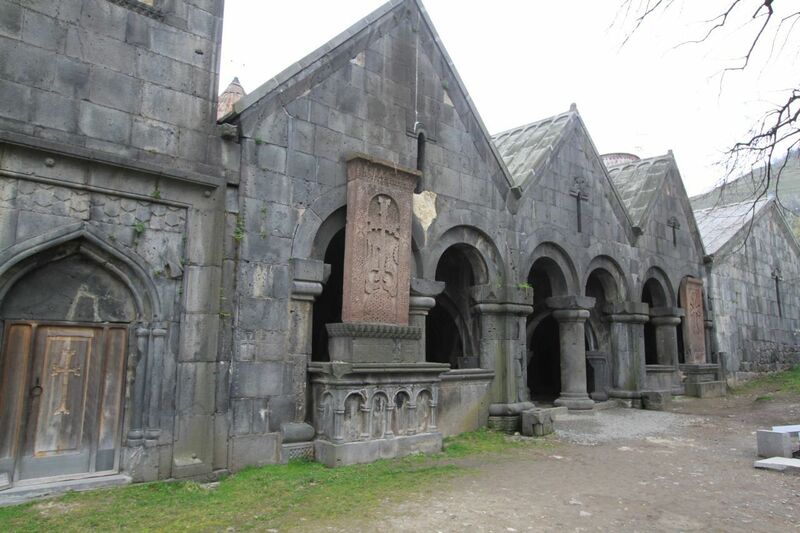 At first glance, it doesn’t seem like there is much there, but on closer inspection you see many carvings and crosses. Afterwards, we did drive up the road to Haghpat and got a smoky view of the town and the cathedral on the hill, but by this time we were really pushing it and were determined to get to Tbilisi. The problem is these places are small, and there just isn’t much infrastructure, so since we couldn’t even find a restaurant, we knew we’d have problems finding a hotel as well. We went to the much larger border crossing at Bagratashen. It was obviously the border of choice with dozens of big trucks and buses waiting to clear customs. Jim headed in with all our car paperwork and actually had to stand in line. It took a little longer to get through, but there were no problems and we were soon on our way with little daylight remaining. We arrived back in Tbilisi at about 8:30 at night, but there we easily found a hotel and some dinner. 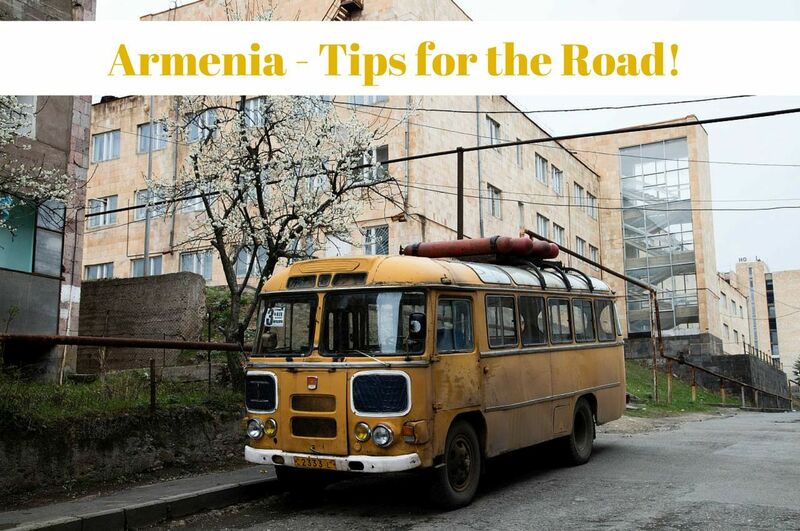 We will be compiling a list of Armenia road trip hints, tips, and all about the border crossing so stay tuned for more in Part 4! Your Armenia road trip looks just incredible. We do plan to get there when we can fit it into our schedule so I’m looking forward to your tips. Curious if it will be hard for us to avoid pork when we go (we eat clean). What do you think? Linda, I hope you are able to get there soon. I’m sure there are plenty of options for you that are not pork. There was plenty of beef, chicken, lamb, and fish on the menu as well as vegetarian options. You’ll be just fine. As I mentioned, restaurants are far and few between elsewhere so maybe just bring food with you. This is a place I’d like to go. Thank you for the great photos and information. Nice post. Well thanks for stopping by Christine. Wow…! Armenia, Georgia and Mongolia are three big stops on my bucketlist. Your pictures are beautiful. A great post that makes me want to travel to Armenia… Was the food as good as I imagine? Gabi, I’ve been to all three, and they are very worthwhile…some of my favorite places. I did enjoy the Armenian food, but like I mentioned sometimes it’s hard to find restaurants in Armenia. I don’t think locals eat out that much. 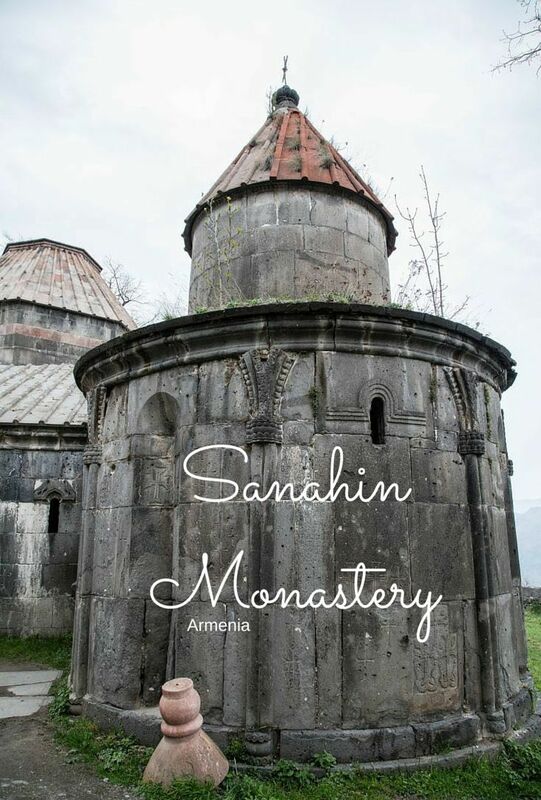 The Sanahin Monastery looks fascinating. Also was pretty interested in the oven built into the floor where the baker stuck the dough to make flat bread, interestingly in India, especially in the northern region, we have something similar called Tandoors, in which Indian Bread, called Rotis are baked. Vyjay, I would love to cook roti in a tandoor. 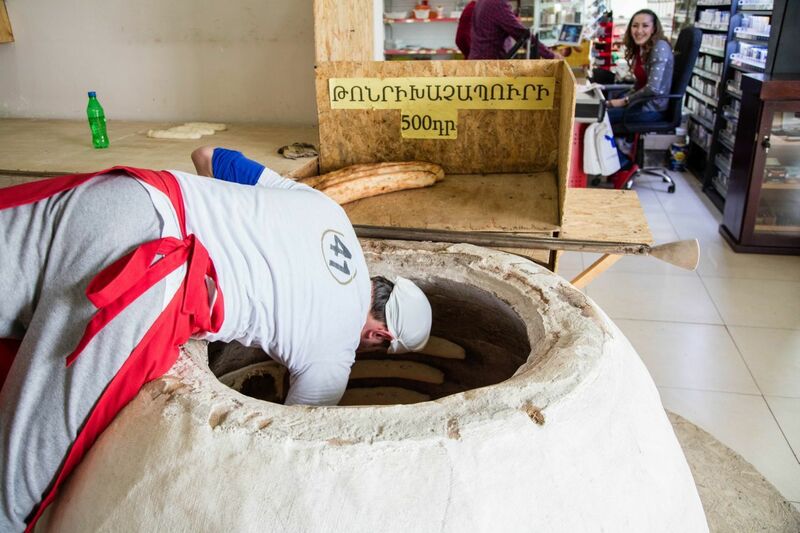 I didn’t get to use the oven in Armenia either, but I would have loved to do that as well. What an amazing road trip experience! That Monastery looks fascinating. Marianne, It was wonderful. We loved it all! Thanks Ami. We had so much fun photographing the gorgeous Armenian landscapes. What a cool place, and it seems so tourist free, even with the bus of German visitors. 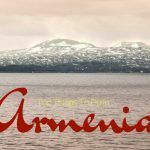 Armenia does seem like such a back-page gem. Rob, There were very few other tourists. Most of the time we were by ourselves, with wide open spaces. It is a little off the track, but well worth it! 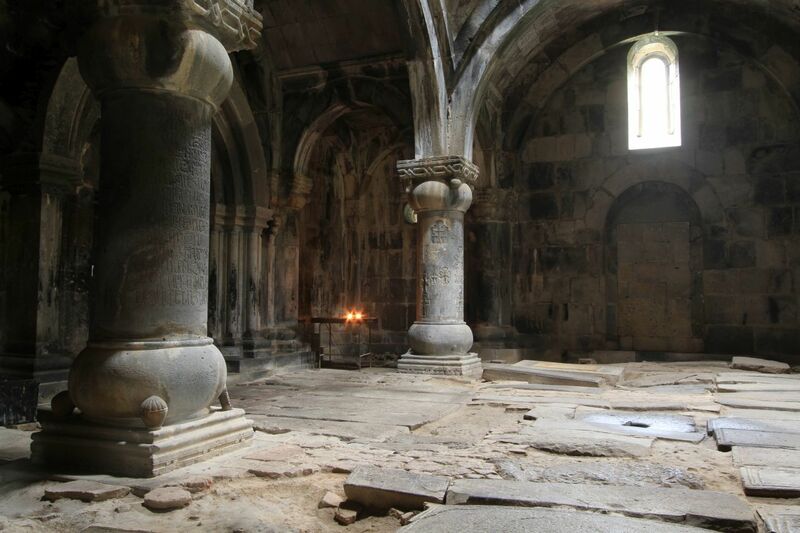 Allison, If you like to explore little-known places, Armenia is for you! I can’t wait to read more about road trip tips. Border crossing, especially with lots of big trucks and waiting, really stress me out. Also, I’m glad that I don’t have that one baker’s job! Ann, All the bakers had a tough job. Those ovens are hot! 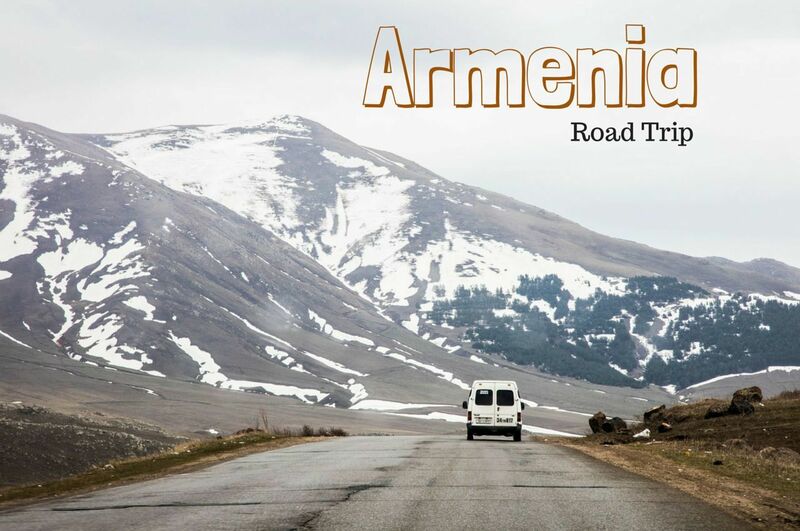 We love a good road trip and Armenia sounds like an adventure. There’s just something about the open road and the sense of expectation about discovering something new around the next corner or in the next town that keep is so exciting! Your explanation about the fresh bread made us hungry! The bread was amazing! It was the beginning of spring so there was lots to see, new growth, baby animals. It was a great trip! The churches look like the Georgian Churches in North-East Turkey. I would like to do this road trip. I see it is not far from Dogubayazit in Eastern Turkey where there is the gorgeous Ishak Pasha Palace. 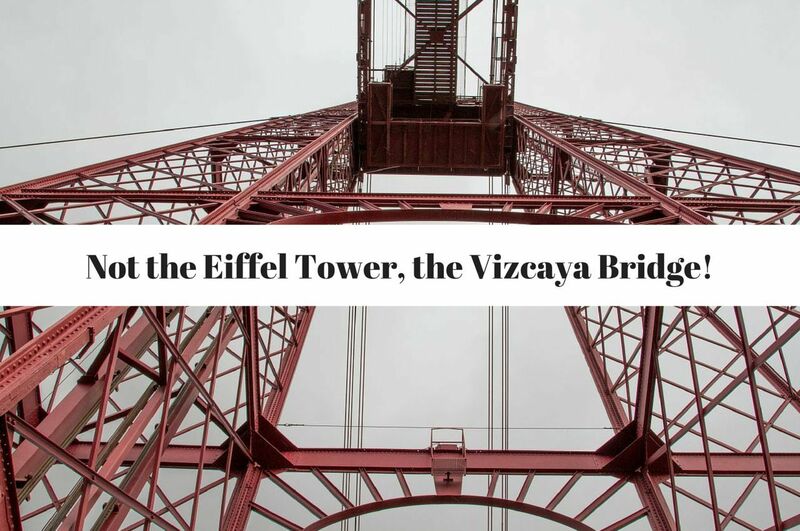 That would make a good side trip from Dogubayazit if you could cross the border there. Jan, I just set up a post about Ishak Pasha! You must have read my mind. It won’t come out for awhile, but it’s scheduled. It’s such a beautiful part of the world, isn’t it?